Friend, a graduate of KLO Secondary School, went to Western Michigan University and the University of California Santa Barbara where he studied business economics. He captained the UC Santa Barbara men’s soccer team, was named an All-American and was also the 2001 NCAA Division 1 top scorer. After graduation, he was drafted into Europe’s professional league, playing with Norway’s most successful club, Molde FK, which won the prestigious Norwegian Cup in 2005. His career came to an end in 2014, shortly after joining LA Galaxy in its MLS championship-winning season. One too many headers and several severe concussions ended his game. He explained the transition to the sidelines is like suddenly losing your entire identity. Everything you woke up for, the years of training, the game you loved, the team, was taken away. He is now helping other athletes learn to deal with similar conditions. Friend was interviewed during the breakfast by Pat Kennedy, managing director of the Central Okanagan Sports Hall of Fame. While there were some somber moments and a key message about playing while concussed, he was also able to speak about the game he loved and the absolute joy of playing both professionally and for the Canadian National Men’s team. Each spring, UBC Okanagan hosts the Valley First/UBC Okanagan Athletics Breakfast as a fundraiser to support student athletes. Okanagan Heat basketball point guard Mitch Goodwin, a Kelowna Secondary School grad and fourth-year Human Kinetics student, thanked the many supporters and explained that Heat athletes are not only busy on the courts, fields and in classrooms, but many volunteer throughout the community. UBC Okanagan Heat teams have had a stellar year, with the women’s volleyball team earning a National Bronze medal just five years into Canadian Interuniversity Sport (CIS) league play—something never accomplished by any other team. The team’s coach, Steve Manual, was named the CIS Coach of the Year. Several Heat teams earned medals at both the provincial and national level, and Carolyn Lee won a National Gold medal as the top individual female golfer. While Rob Johnson, director of UBC Okanagan’s Athletics & Recreation, spoke about the many academic and athletic accomplishments of Heat student athletes, UBC Deputy Vice-Chancellor and Principal Deborah Buszard tallied up the total raised at the breakfast event and thanked the audience for its continued support. As a result of the scholarship, $16,500 in awards is available to student athletes for the coming year. The funding allows the student athletes to focus on their studies. High academic achievement is expected from all Heat players, not just athletic excellence. 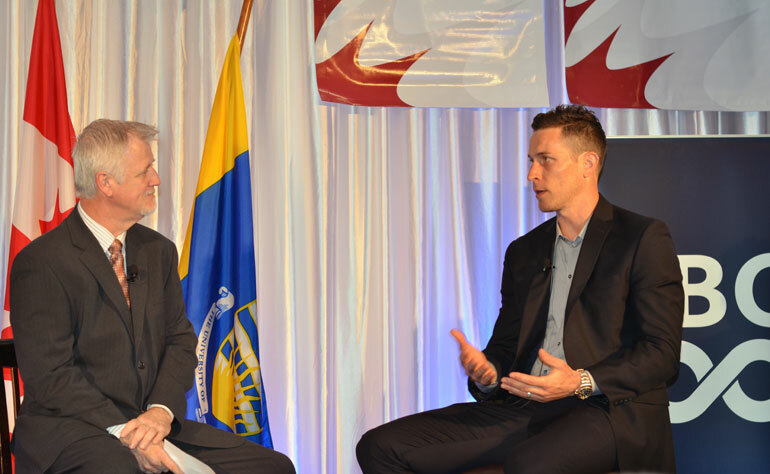 Pat Kennedy, managing director of the Central Okanagan Sports Hall of Fame, interviews retired professional soccer player Rob Friend at UBC Okanagan’s 11th annual Valley First/UBC Okanagan Athletics Breakfast. Rob Friend played for bigger clubs in Europe than Norway's Molde. He played in the Dutch Eredivisie for Heerenveen and in the German Bundesliga for Borussia Monchengladbach, Hertha Berlin, Eintracht Frankfurt and Munich 1860. He was a top goalscorer for all of these clubs. He is one of the most successful Canadian soccer players in Europe of all time.